Considering my history with disliking fantasy or extreme sci-fi novels, I did not expect to like this book. Besides the genre, the format of this book is also not something I am normally used to, nor is the length. However, the hype sucked me in. 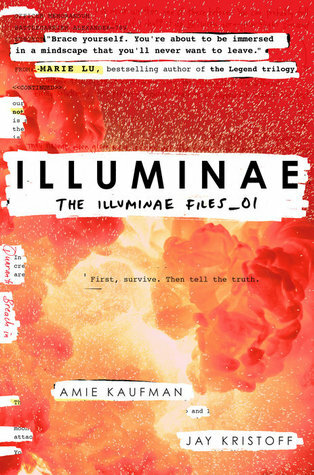 Despite all of these concerns, I actually adored Illuminae! To start off, I really liked the characters, specifically the main heroine Kady. Kady was an incredibly brave, selfless, and strong girl. I honestly don’t know how she managed to survive through all of the obstacles she was faced with- it was crazy to see her bounce back and recover from them every single time! AIDAN, the artificial intelligence, was simply hilarious to read about! He often had these really kooky revelations and opinions that had me chuckling throughout the novel, and I am super excited for more of him! Illuminae is one of the most event-filled, action-packed novels I have ever picked up. Not only is it extremely plot-driven, but it is also super fast and nothing left me bored at all, and books of this type often have the potential to put me to sleep. All in all, if you are looking for a futuristic story set in space that is packed with punch, then Illuminae is your dream book. Both the characters and the plot were absolutely astonishing. However, although the story was entertaining, it was a little long and strenuous to read at times due to the format (it was cool though! ), so for this reason, I will be deducting one star. Anyway, I can’t wait to see what happens in Gemina, and I have my fingers crossed that it will be just as awesome- or even more so- than this one was! Agreed! Illuminae is so action-packed, and the format is incredibly creative (but doesn’t diminish from the storytelling). I listened to the audiobook version, which ended up being my favorite audiobook listening experience to date. So fun!